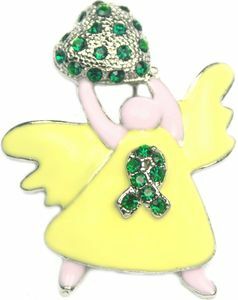 This Go Green Awareness Angel Pin features a beautiful stylized angel wearing a cream dress with a green awareness ribbon made out of rhinestones on her heart. She also holds a green rhinestone heart above her head. A wonderful way to show your support for Green Awareness. Measures 1.75 inches by 1.25 inches. Locking Brooch pin back for security. Make sure to check out our full selection of Go Green Awareness Products!